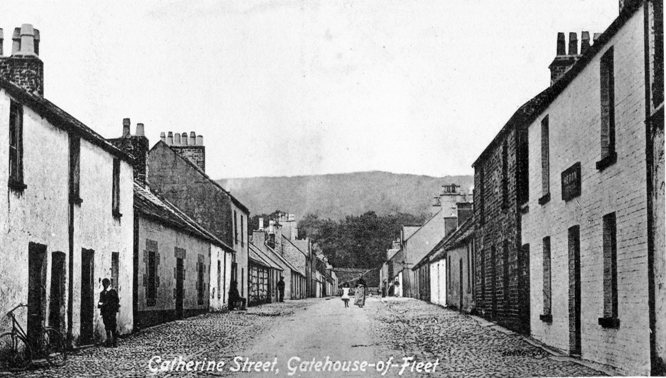 Above is an old postcard picture from near the west end of Catherine Street. The original photo is believed to have been taken in 1907. Just beyond the white-walled, single storey building on the right , and just before Digby Street, are nos. 40 & 42 Catherine Street,which were demolished shortly after WW2. Nos.40 & 42 are in the foreground on the right. This old wintry photo is taken from the East end of Catherine Street. 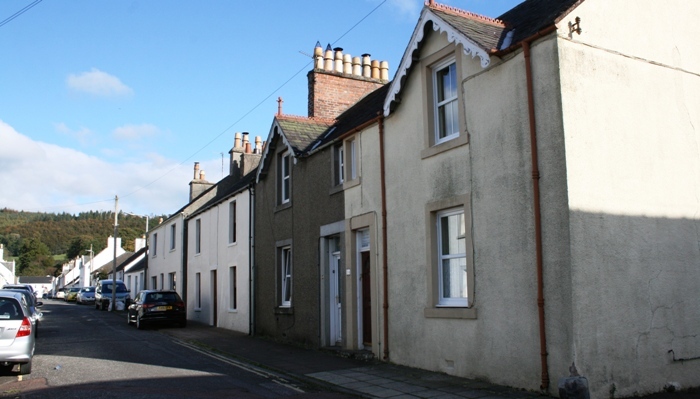 On the left are 3 single-storey properties being nos. 2, 4 & 6 followed by the 2-storey building of no.8. On the right is a series of 2-storey buildings, nos. 1 to 7 Catherine St. which are now demolished. Over the years there has been considerable re-development of housing in Catherine Street (originally called Back Street). This downloadable file shows maps of Catherine Street in 1854 and then again around 1900 and around 2000. 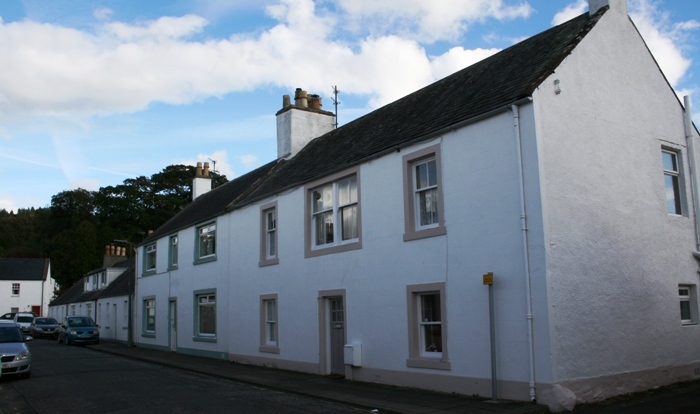 This downloadable file lists the first feuars of houses in Catherine Street. Here is a table which lists the heads of households in each census, alongside the present-day house numbers at which we think they lived. Below are photos of groups of houses. Click on the house number below the relevant photo to open a .pdf file showing what we know about who has lived there. Remember to come back to this page using your browser's 'Back' button. The census of 1841 was the first UK census, and it has been particularly difficult to allocate people to houses from it. A large number of people lived in Back Street, as it was called at the time. Many houses were not occupied by the owners and most properties housed multiple families. Also the enumerator visited property in 3 separate blocks : east, west and central. Valuation Rolls became a source of information from 1855, but because houses were rented at less than £4 per year, the occupants' names were not recorded. As a result we have tried to allocate people to houses ifrom 1841 onwards, but we cannot guarantee the accuracy of this work for the early years.. This photo shows the north side of Catherine Street from no.39 upwards, probably taken about 1920. No.39 is on the corner of Digby Street and in this picture it has a door onto Catherine Street (nowadays the door is off Digby Street). 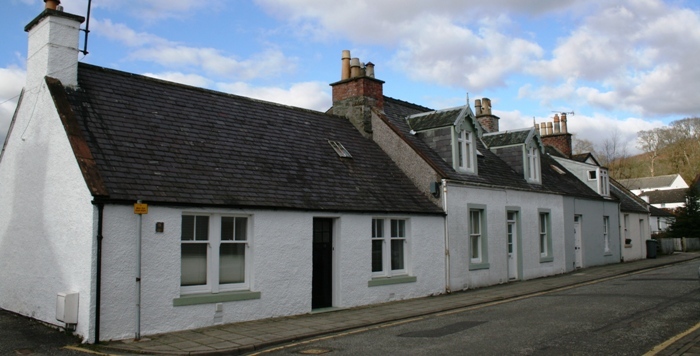 Note that no.43 was a 2-storey building that was later condemned and rebuilt by Leo McClymont to form a single-storey house (in conjunction with no.45 next door). This photo shows where the doorway used to be on no.39, whilst no.43 has a much lower roof level. We now cross to the south side of the street. Note : No.50 does not exist, but we do have limited information that proves that it did exist.